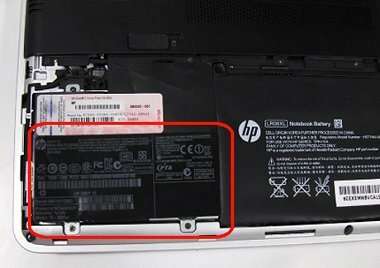 DownloadNp Blog: How To Find Model Number or Product Number Of HP Laptop ? HP provides a type of model name near the keyboard or screen, but this name or number is probably not sufficient to get proper support for your computer. These names or numbers often represent a series of many notebook computers that look similar, but have different options and parts. 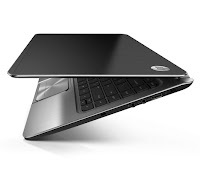 For example, HP has produced over a hundred types of G62 notebook models in different configurations, such as the G62-340-US and the G62-465DX models. 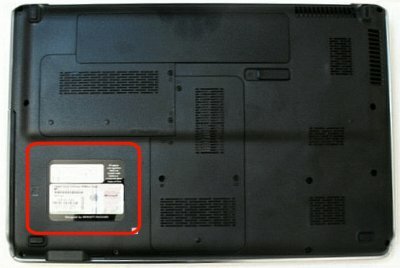 This document describes how you can find a more appropriate model number that better represents your exact type of HP Notebook PC. You can use the model number (also called a product name) to download drivers, find helpful documents, or get on-line support. NOTE: If needed, you may also use this document to find the serial number which is always listed near the product number. Find the product number on a label located on the underside of the notebook. 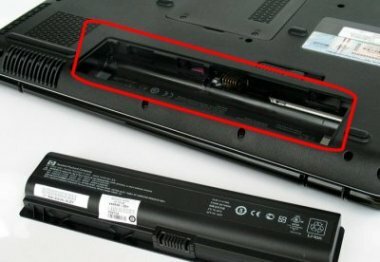 On some computers, the label is inside the main battery compartment and you must remove the battery to read the label (see examples below). Once you have found the product identification label, find the product number shown next to Product or Product # . The following table shows the location of typical product information labels on the underside of the notebook or in the battery compartment. Yours may be in a slightly different location. Use the following steps find your model number using HP utilities. If your computer does not start into Windows, use Option 1: Use the product label . 1. In Windows, press the fn + esc keys on the notebook’s keyboard to open the HP System Information window. 2. A Support Information window appears showing a product name and a product number. The product name shown might represent many types of models and is often not suitable for getting proper support for your computer. Instead, use the product number when working with HP Support. The product number contains a “# ” character and is another form of model number that best represents your computer’s configuration. NOTE: You can use this type of product number at HP’s Customer Care website or when working with an HP Customer Care representative. 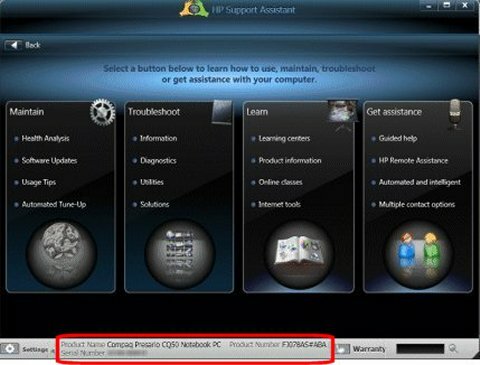 If this Window does not open, continue using these steps to use HP Support Assistant. 3.Click Start , enter HP in the search field, and select HP Support Assistant from the search results list. 4.Find the product number displayed on the bottom edge of the window.